What Day Of The Week Was April 16? 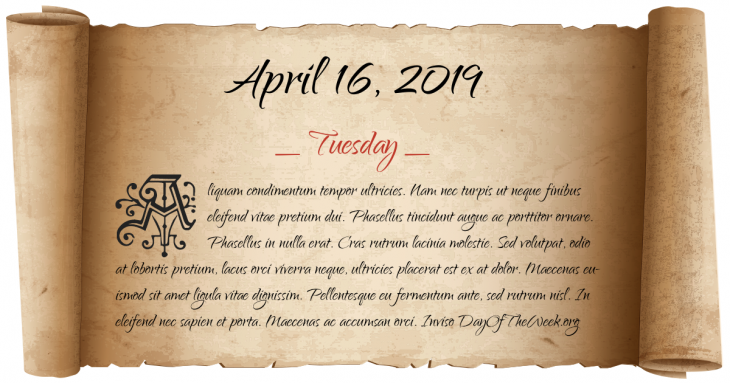 April 16, 2019 was the 106th day of the year 2019 in the Gregorian calendar. There were 259 days remaining until the end of the year. The day of the week was Tuesday. Napoleonic Wars: The Battle of Mount Tabor – Napoleon drives Ottoman Turks across the River Jordan near Acre. American Civil War: The Siege of Vicksburg – ships led by Union Admiral David Dixon Porter move through heavy Confederate artillery fire on approach to Vicksburg, Mississippi. Lenin returns to Petrograd from exile in Switzerland. Gandhi organizes a day of “prayer and fasting” in response to the killing of Indian protesters in the Amritsar Massacre by the British. Allied forces started bombing of Belgrade, killing about 1,100 people. This bombing fell on the Orthodox Christian Easter. More than 7,000 die when the German refugee ship Goya is sunk by a Soviet submarine torpedo. Texas City Disaster: An explosion on board a freighter in port causes the city of Texas City, Texas, to catch fire, killing almost 600. Queen Elizabeth II launches the Royal Yacht Ship HMY. The Treaty of Accession is signed in Athens admitting 10 new member states to the European Union. Who were born on April 16?